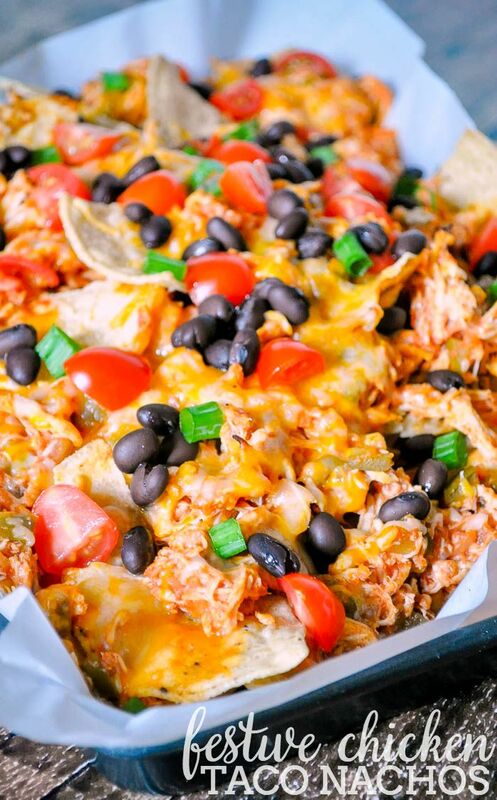 Festive Chicken Taco Nachos are perfect any day, but especially Game Day! Our Sundays are now consumed by football. It’s not really my thing, but I am trying to be a good sport this year. Bryan loves it, and it is certainly nice chill time on the couch with him. To survive multiple games though, yummy game day food is a must! 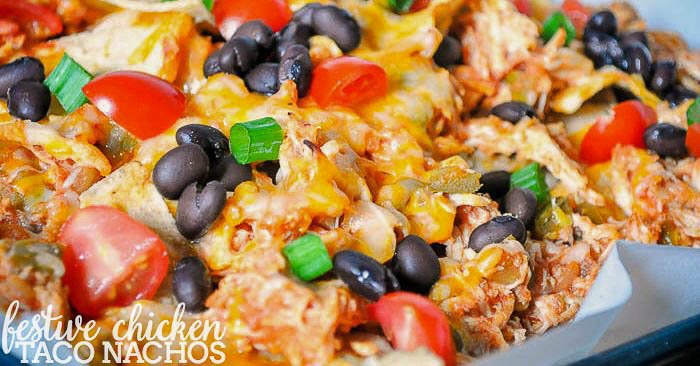 Enter these Festive Chicken Taco Nachos! I took a recipe from Pace for Festive Tacho Nachos and made a few changes. I made a few changes though for our personal tastes, switching out the ground beef for chicken and black beans for the black olives. 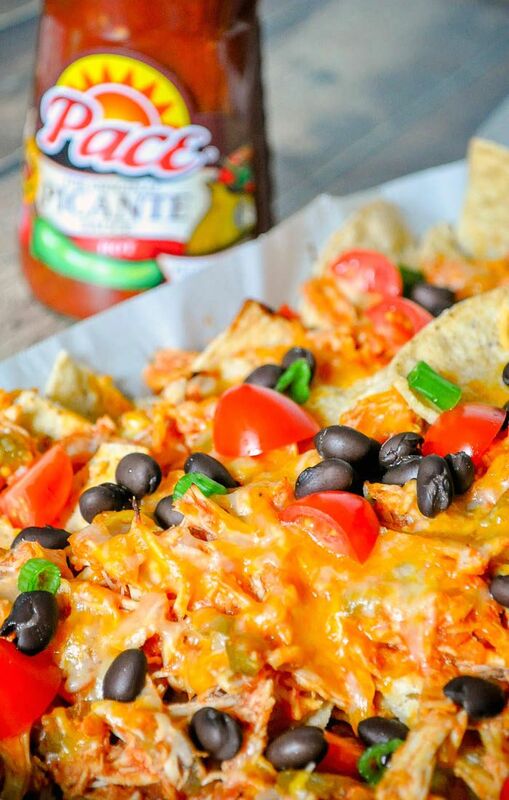 My favorite part of this recipe is how the Pace Picante Sauce is cooked into the shredded chicken. It doesn’t take long for this step but you get fabulous flavor with every bite! Plus, I always feel like salsa that is normally just dumped onto nachos can tend to make them a bit soggy. This way – everything was baked to perfection. With an extra layer of cheese halfway through the chips – of course. 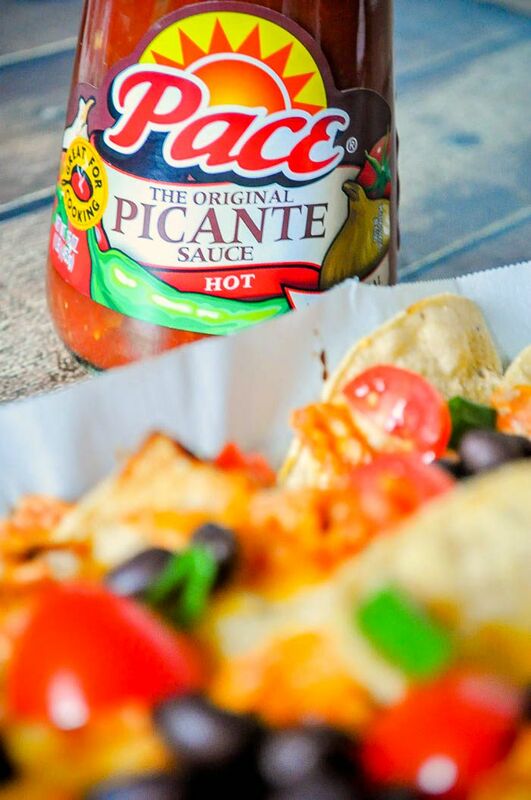 Pace Picante Sauce always delivers great flavor! It is definitely a pantry staple because it can enhance so many recipes, including breakfast, snacks, dinner and especially game day snacks! Right now, you can pick up Pace 16 oz varieties 2/$4 at your local Albertsons, Safeway, or in my case Jewel-Osco through October 13th. It’s the perfect time to try these Festive Chicken Taco Nachos or any other recipes at Campbell’s Kitchen. Set the oven to 350°F. Stir the picante sauce in a skillet with the shredded chicken. Cook on low for around 5 minutes, stirring occasionally. Arrange half the tortilla chips on a rimmed baking sheet lined with parchment paper. Add some cheese and arrange the second half of the chips. Add chicken and Pace Picante Sauce mixture and top with cheese. Bake for 5 minutes or until the cheese is melted. Top with the tomato, black beans, and green onion. 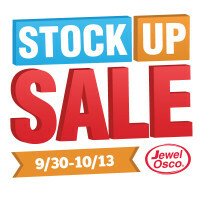 Do NOT forget to pick up Pace Picante Sauce at Jewel-Osco through October 13th. There are 16 oz varieties on sale for 2/$4. 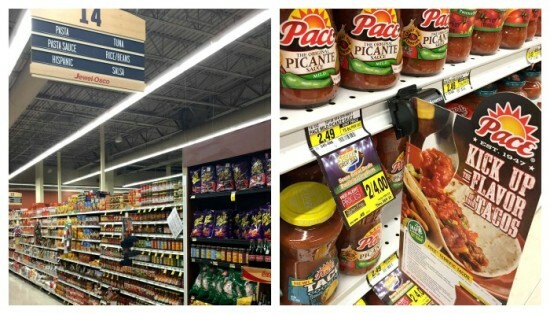 You can find it in the “Salsa” aisle – super easy!